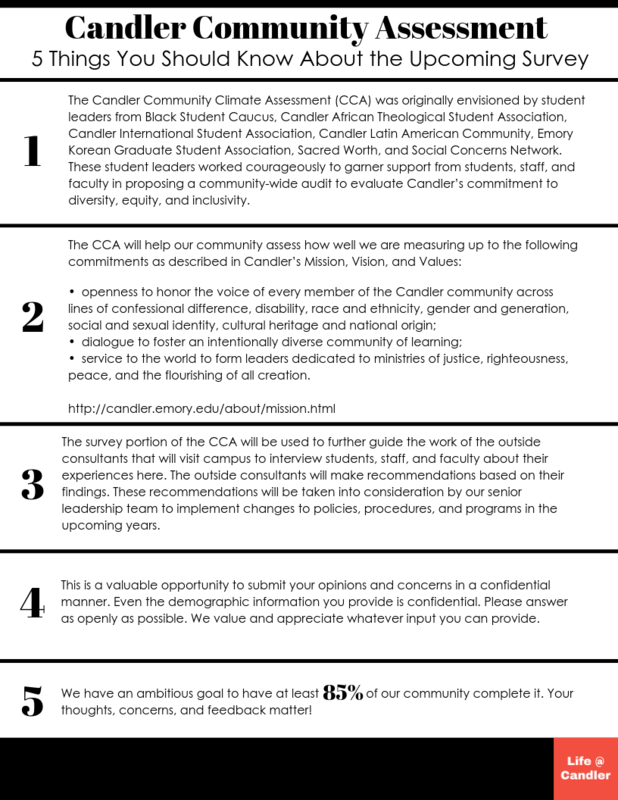 The Office of Equity and Inclusion invites you to participate in the Candler Community Climate Assessment. The survey asks your opinion on items related to inclusion on campus. The survey is being administered to all Candler students, faculty and staff. Results from this survey will be used to understand and improve the climate of diversity and inclusion, and help us develop future initiatives. This is a valuable opportunity to submit your opinions and concerns in a confidential manner. The survey is being administered separately from Candler School of Theology, and they will have no access to the raw responses. Results will be shared only in the aggregate, and will not contain any information that would permit identification of an individual. Please note that responses to open-ended questions will be released unredacted to senior administrators. We value and appreciate whatever input you can provide. The deadline for completing the survey is Friday, April 19th. Completing the survey takes approximately 5 minutes. If you have any questions, please contact Oana Tudorancea at oana.tudorancea@emory.edu. Check your student email or visit the OSP for more information and to learn how to access the survey.